With Day of the Dead recently upon us, a few weeks back my partner and I decided it was time to stock up on alfeñiques. A traditional treat here in Mexico, alfeñiques are extraordinarily sugary sweets that are vibrantly decorated – making them a treat for both your taste buds and your eyes. One of the best places to stock up on these yummies has to be the annual alfeñique fair in Toluca. The fair usually takes place in October, when the city goes a little alfeñique crazy. There’s live dance and music festivals, plus giant skeletons lurking all over the city. However, the real star of the show is naturally the alfeñique market, where you can go nuts buying enough sweets to destroy your dentist’s faith in humanity. 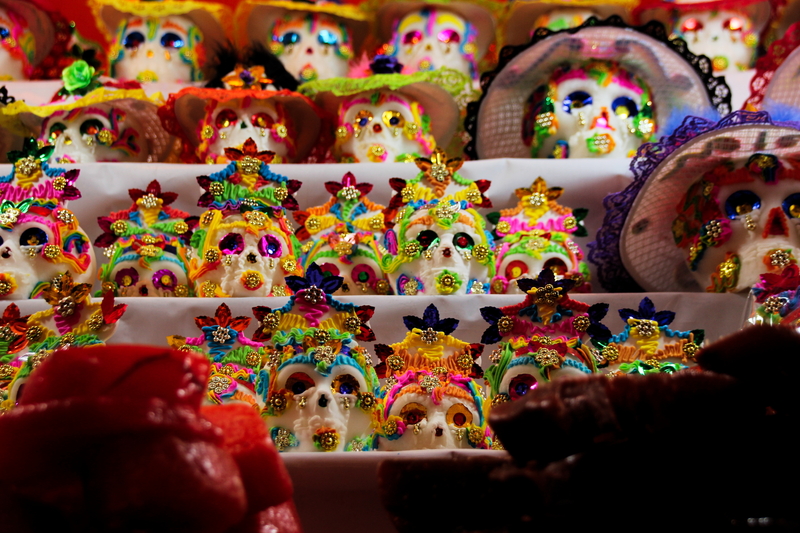 The classic alfeñique is the calavera (skull), though some producers like to experiment with sweets in the shapes of animals, Halloween stuff and the like. Plus, for anyone who isn’t a big fan of chomping down what’s basically pure sugar, there’s always plenty of chocolate around, too. To find out more about alfeñiques, I’d highly recommend checking out my partner’s recent article on their cultural significance. Alternatively, while you’re in Toluca you should totally have a peek in the Alfeñique Museum, which offers a delightfully light-hearted tour into the history of the alfeñique. If you’re still looking to kill some time after the museum, Toluca has plenty of other neat attractions up its sleeve. The only must-see is the Cosmovitral, an indoor botanic garden replete with some impressive stained glass murals. Given its humble exterior, the gardens are surprisingly pleasant, and were visited a few years back by the then-trio of North American leaders: Barack Obama, Enrique Peña Nieto and Stephen Harper. They even made a somewhat awkward monument to the occasion, which makes for an equally awkward photo moment. Other than that, the only other major attractions are the Centro Cultural Mexiquense and the Museo Modelo de Ciencias e Industria. The former is a complex packed with various museums that you can smash one after another. The latter is a museum dedicated to beer giant Modelo. To get to Toluca, you’ll probably end up going via Mexico City’s western bus depot. It’s located just outside the Observatorio metro station, and has regular buses to Toluca that take roughly an hour, depending on traffic. Once in Toluca, your best bet is to catch a cab from the terminal to reach the city centre. The ride is only a few minutes, and shouldn’t cost you more than the equivalent of a dollar or two.